BOXING LEDGER | LATEST BOXING BLOGS | BOXING ARTICLES | BOXING BLOG FIGHT: Jermain Taylor Pulls Out Of "Super Six"
Jermain Taylor Pulls Out Of "Super Six"
Jermain Taylor (28-4-1, 17 KO’s) has given the public memorable fights and showed that he is a warrior on many occasions. In 2005, he defeated the legendary Bernard Hopkins twice (SD 12, UD 12) and was regarded as one of the best fighters in the world. After capturing the Middleweight title from Hopkins, Taylor successfully defended the title three times. He received a draw against Ronald “Winky” Wright, but defeated Kassim Ouma (UD 12) and Cory Spinks (SD 12). 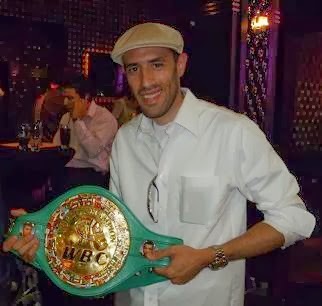 Taylor held the middleweight championship until 2007 when Kelly Pavlik TKO’D him in seven rounds. Later in the year, Taylor fought valiantly in the rematch against Pavlik, although he came up short, losing a 12 round unanimous decision. Since 2007, Taylor has only been victorious once, winning a 12 round unanimous decision against Jeff “Left Hook” Lacy in 2008. Most recently, Taylor was brutally knocked out twice in the 12th round in back-to-back fights against England’s Carl Froch and Germany’s Arthur Abraham. The devastating loss versus Abraham came in Showtime’s “Super Six” Tournament. Today, Jermain Taylor withdrew from the "Super Six" Tournament and will not face Andre Ward on April 17th. "I'm going to take some time off from the sport of boxing and take myself out of [the] Showtime Sports World Boxing Classic tournament," Taylor said in a statement. "It's important that I give my body and mind some much-needed rest, because I have been boxing for nearly 20 years. I plan on keeping myself in shape and making a return to the sport sometime in the future." After being knocked out in 3 of his last 5 bouts and going 1-4 over that span, many boxing insiders and fight fans thought Taylor would have made a colossal oversight by taking a fight with Ward. "This was not an easy decision for me, having discussed it with my family, trainer [Ozell Nelson], friends and my adviser, Al Haymon, because I'm a very competitive person. But I know this is the smart road for me to take," Taylor said. "I want to thank Showtime Sports for everything and I wish the best for my five counterparts who will continue on in the Super Six tournament. Most of all, I want to thank the many fans for their continued support."